It wouldn’t be Christmas in my family without enjoying my Grandma's famous Christmas pudding with brandy sauce. Months in advance my Grandma gathers together the ingredients, soaks the fruit, steams the puddings and finally stores them safely away in the very back of her fridge ready for Christmas. It’s one of the highlights of Christmas day and is loved by all who have had the privilege of consuming its fruity goodness. She has promised to teach me all she knows and I hope to feature her loved recipe on the site in the near future. 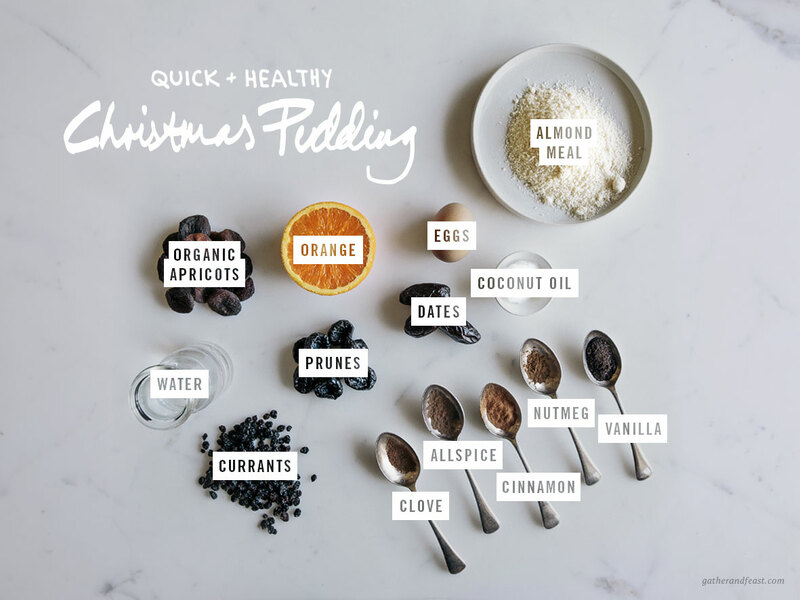 But TODAY I am excited to share with you this gluten, dairy, and refined sugar-free, quick and healthy Christmas pudding recipe (hello long descriptive title). This pudding is dense, full of flavour, and unlike traditional puddings only takes a few hours to create. Winning! My mum is gluten intolerant so I usually prepare this pudding for her at Christmas. She can attest to its deliciousness! Also if you haven't already, make sure you check out my other Christmas posts, especially my Christmas Music Playlist and my Free Christmas Gift Tags! Grease a medium sized pudding bowl. Combine dates, prunes (200g), orange and water into a saucepan and bring to boil. Simmer for 10mins or until the water has evaporated and the dates have formed a thick paste (the oranges will still be intact, this is ok). Stir through the coconut oil and set aside to cool. Place the cooled date mix into a food processor and process until smooth. Transfer to a large bowl and add chopped apricots and prunes (100g), currants, almond meal, vanilla, cinnamon, allspice, clove, nutmeg and the eggs and mix well. Pour the mixture into your prepared pudding bowl. Place the pudding bowl into a deep baking tray (I use a roasting tray), then pour in hot water until it reaches ½ to ¾ of the way up the roasting tray. Cover the tray and pudding with a layer of baking paper and foil. Make sure it is completely sealed so no steam can escape. Bake for 1 hour and 30 minutes. Carefully remove the tray from the oven, but be careful there is very hot water in the tray! Remove the foil and paper away from yourself to ensure you don't get burnt by the steam escaping. Loosen the edges of the pudding with a knife and turn onto a serving plate. ​Serve with Almond Milk Creme Anglaise. Enjoy! A few of my favourite savoury ingredients! This combo may sound a little strange for crepes, but trust me, it is delicious! This week’s recipe are these super cute and delicious vegan loaf cakes, full of some of my favourite flavours; fresh pear, strawberries and vanilla.